Purchase eBook versions of select magazine issues. Purchasing an ebook version supports my efforts to provide support materials for teachers and students. Books sales are provided by Amazon. Follow along with step by step instructions. Design a rubber band powered car. Use the design process to reinforce STEM concepts. Basic math concepts include radius, diameter, circumference, area, and volume. Students use the coordinate system to measure length and width. They understand that the coordinate plane includes a third-dimension. Measurements along this plane are made along the z-axis. 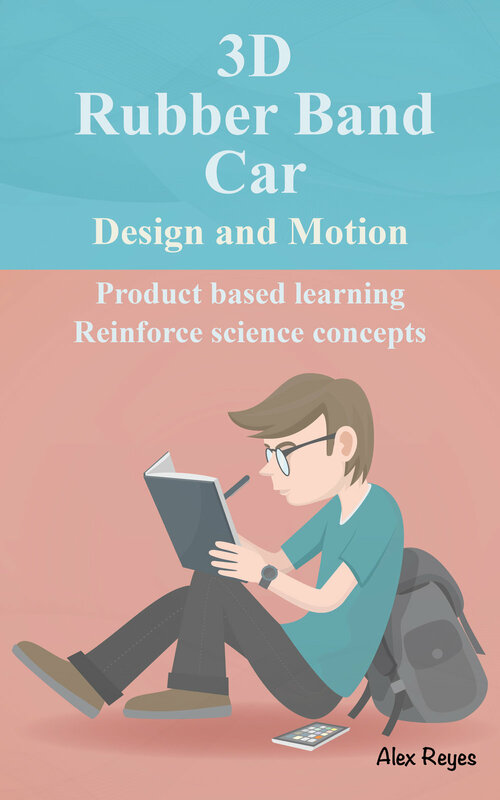 Use the printed car to teach science concepts related to motion, velocity, acceleration, and force. Other science concepts include potential and kinetic energy. Use Tinkercad to design the car. Learn to navigate the Tinkercad environment while developing the model. Use the ruler for measurement.Combine geometric shapes to form new shapes. Learn to convert shapes into holes. Use those hole shapes to form new shapes. The book is illustrated with over a hundred images. Each image shows important steps in the process. Purchase an ebook version on Amazon or a PDF version from Teacher Pay Teacher. Use Tinkercad’s free circuit design portal. Use simulated electronic components. Teach basic science concepts related to electricity and electronics. Construct basic to elaborate circuits. In the book, you will learn how to use a breadboard to assemble electronic components. Breadboards are often used to develop prototypes of circuits. You will learn how to create a closed circuit using a power source, LED, and switches. Assemble a circuit with a push button and another with a switch. You will learn how a resistor is used in a circuit to limit the amount of current sent to components. Teach and reinforce concepts related to voltage, current, and resistance. Learn about voltage tolerances in components like LEDs. Understand how a resistor prevents damage to components. Understand the difference between voltage and current. Follow along with step by step instructions. There are lots of illustrations that demonstrate important steps in the process. Scratch was developed at MIT for children. The goal is to teach young children to code. The code blocks are like puzzle pieces that snap together. The application is geared to help children develop interactive stories and games. 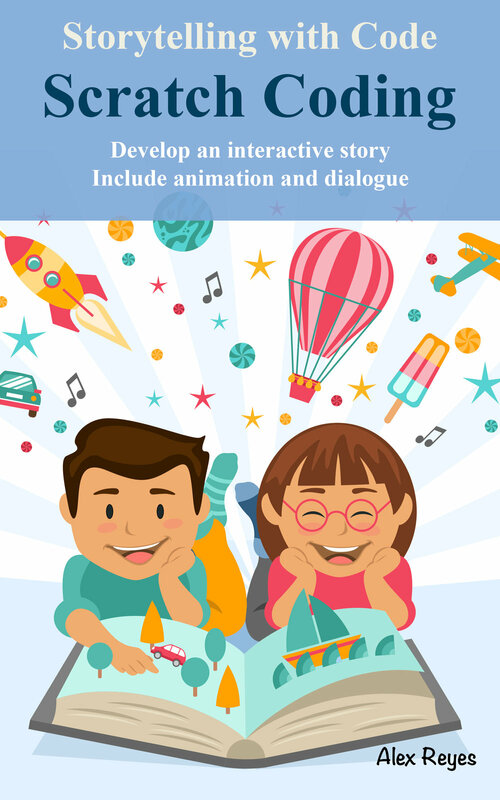 In this ebook, students learn to code a basic story. Students add and code sprites onto a stage. Sprites are graphics used in applications. Students develop coded instructions that pass messages to other sprites. Sprites listen for these messages and respond. Learn to use sprite costumes to simulate basic animation. Publish and share stories. The book has step by step instructions to develop a basic dialogue between sprites. There are plenty of illustrations to accompany important steps. Introduce students to the 3D design and print process. This basic lesson introduces you to the Tinkercad environment. Design and print a basic wheel and axle. Teach and reinforce basic math and science concepts. Students understand how concepts learned in the classroom relate to real-world products. Basic math concepts include radius, circumference, area, and volume. Basic math concepts include simple machines, work, friction, and gravity. Understand how the printing process is limited by gravity. Learn how to print this object without the need for supports. Supports are needed when printing objects above the surface. Supports need to be removed and consume filament.